It's been one year since I created the original blog thread on SF-O. Should I be reflective on this moment? Probably not. But, I guess I can put myself in review. Since last year, I'm still playing competitive TF2 in UGC. What has happened since then? In UGC Season 12 (January - April 2014) I was leader for TAGC in Steel. A team that I later destroyed for various reasons. UGC Season 13 (Summer season) Finding a team was difficult, and I ended up on Team Celebrity. I was interim leader with the team from the end of Season 13 through the off-season. During the same season, Icy led Area 6 Veterans; a team with SF-O members at its core. UGC Season 14 was the first season I chose not to commit to a starting spot. This was because of how busy I am, and how much of a break I needed from the previous two seasons. Three weeks ago in mid-October, I went to the GXL LAN and played TF2 and shook hands with many big-name and very good players. 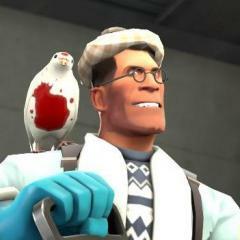 I started playing TF2 with SF-O, and eventually that somehow led me to get into competitive. Welcome aboard, Hidi. It's always nice to see you in this neck of the woods. It's also nice seeing how communities engage and then shape folks.